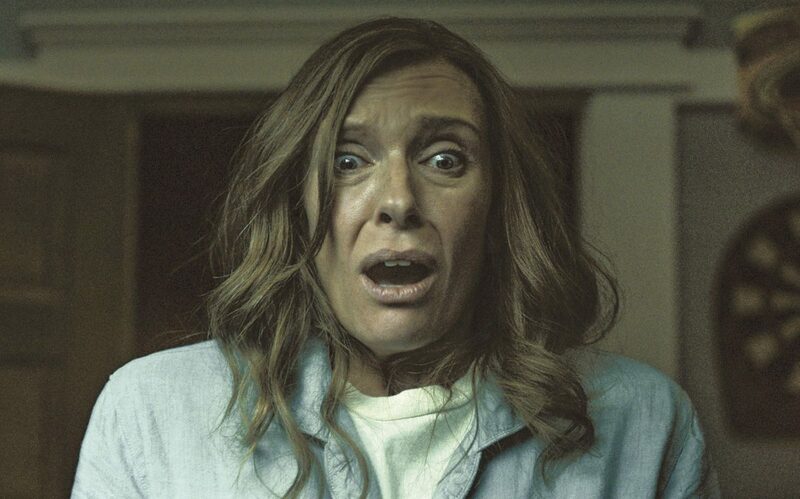 REVIEW: What’s more terrifying in ‘Hereditary’: The evil fighting to get in, or creeping from the inside out? “Hereditary,” writer-director Ari Aster’s first feature, accomplishes the unusual feat in horror films of making each of the main characters so memorably unique, so disconnected from their kin and yet bonded by blood and skin and behavior, that their fates affect each other like the intertwined gossamer of a spider’s web, each rivulet of pain or terror through one body viscerally tumbling under the others’ skin. You will want to watch this film again just to catch all the tiny things you are sure you didn’t see correctly, and all the dots you are sure you missed that would explain the terror this family experienced. Hereditary commands you to lean in, watch closely, don’t forget the corners and the background, even though you know the monsters are there. You KNOW they are there, and yet you do as you’re told. The scenes in the trailers include most of the outwardly scary parts — figures on fire, children being choked in their beds or decapitating a dead bird with scissors, Toni Collette steadily losing her mind — that dot a story of a family encroached upon by a growing sense of dread that starts in the shadows of both the rambling house in the woods and in the small, innocuous corners of the mind and slowly manifests itself into a responsive entity that attacks from the outside in and the inside out. To make matters worse, the family can not figure out when it began or when it will end, only that it knows their fears and weaknesses and has the patience to wait, and toy, and retreat, and wait. Toni Collette is simply riveting as Annie, a daughter to a recently deceased mother with whom she had a fractured and volatile relationship, a mother to two children whom she treats very differently, and a wife to Steve (Gabriel Byrne in an outwardly sedate but terrific performance as well) who asks nothing of her but calmness and stability after several shocking events throughout their marriage. Their son, Peter (Alex Wolff) is about 17 and all arms and legs, his wide eyes searching for approval and desperate for friendship. Charlie (Milly Shapiro) is a strange 13-year-old girl, small for her age, her sitting posture often curled inward like a turtle as her messy hair shields her contemplative face. When she does look up, her face masks both an old soul and a separate consciousness, as if she is simultaneously living in the physical world and another realm in which she solely inhabits. She sees what others don’t see and reacts in ways they don’t. Steve regards her with tired bewilderment, as he is used to her eccentricities such as her twig figures and morbid drawings in a sketch book, but Annie is more fascinated by Charlie as a singular being she will never be able to fully figure out, though both females have more in common than they realize. The film begins with an exterior shot of the family home, then the camera enters into a craft room with disemboweled miniature rooms of dollhouses in various stages of completion. It focuses on a figurine lying on a tiny bed, and as the tiny bedroom fills the frame, it comes alive as Steve wakes a sleeping Peter to get dressed. Benjamin Kracun’s exquisite cinematography is the essence of the film’s structure: a congruence of reality versus construction and what the characters perceive versus what is clouding their perception, like a camera photo placed next to its negative image. Similarly, the hauntingly beautiful production design of Laura Ellis Cricks and her myriad of houses within houses and scenes within scenes emphasizes doors and windows that provide access into the most intimate places. Annie’s mother’s funeral is attended mostly by strangers to the family who leer at Charlie as if they know her. Indeed, there is an unspoken familiarity among the attendees that the family is not privy to, but only Charlie senses this. Annie does not miss her mother (she even asks Steve if she should be “sadder” and admits to a grief-support group that her mother was extremely manipulative) but she feels her presence and influence all around, especially when her emotions run high. Whenever she talks about her mother, which is usually in a negative or critical way, her voice and mannerisms change as if to emulate the woman’s worst traits to show her audience, “See how terrible she was?” In fact, she can do such an uncanny impression of her mother that at times it seems almost natural. Oddly, it is only when speaking to Charlie about her grandmother that tenderness is shown towards the deceased woman, albeit in a very unsettling way to the viewer. Charlie, Annie admits, was her grandmother’s favorite, though Charlie says that her grandmother wanted her to be a boy. Annie brushes this off as being a tomboy, but slowly a pattern emerges that makes such obliviousness among the four family members more vivid. Throughout the movie, each person lacks or loses one of their senses that therefore affects their perceptions. Charlie sleeps in an outdoor treehouse barefoot and with no portable heaters, even though it is freezing at night. Annie, who designs the miniature houses and buildings in the craft room, often gets so immersed in her work that she doesn’t hear things in the rest of the house. When under pressure or stress, Steve refuses to see the strange occurrences at home or disturbing behavior of his wife or child. Peter sustains a nose injury and can’t smell a foul odor that emanates from something terrifying. In all four instances, there is the ominous sense that something is pulling the strings, affecting the family’s physical responsiveness from dull to hypersensitive, depending on how they are used. As Annie’s mental state is reflected in her miniature work and Charlie’s twig figures provide a window into her soul, so Peter and Steve are increasingly at the mercy of a sinister force saturating every atom of what should be a place of comfort and solace. As the family unit slowly disintegrates, each member affects the others in a distorted symbiosis by which corruption is an inherited trait.